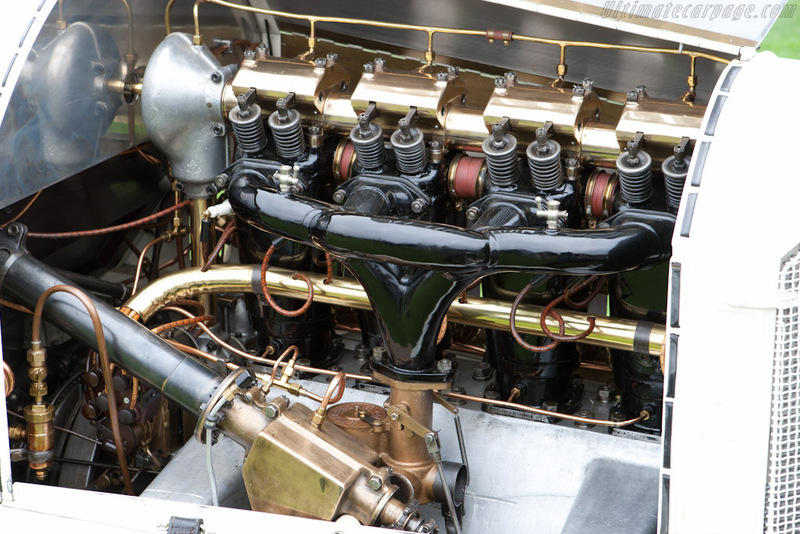 saviour stivala is offering a list of specifications, with descriptions, collected over the years, on a series of significant racing engines spanning most of the 20th century. Focus is on Grand Prix engines, starting even before WWI; but many will fall within F1's realm once the 1950s are reached. I'll be doing the postings a few at a time, but the schedule will be rather irregular. This list is not meant to be exhaustive in any way, but I think it offers an interesting window into competition, power train and technology development. Please feel free to pollute the thread extensively with more details, anecdota, pics, competitors and just anything under the sun. The 1913 Peugeot L3 3-litre four that is said by many to this day as being the one that showed the way forward. A radical design by brilliant 26 year old Ernest Henry that trashed all opposition mainly more than twice its size. First of any kind to combine a vee-inclined 4 overhead valves per cylinder and twin overhead camshafts acting on sliding on a pillar up and down finger followers which had their own spring return. Camshafts driven by a train of gears from crankshaft. A thin-wall cast iron block with an integral cylinder head bolted to a circular tunnel type one piece crankcase. A grove on the left side of the bottom of each cylinder gave clearance to con-rods. Viewed from front of engine the block was offset 20mm to the right (desaxe position) to minimize piston side thrust and maximize leverage on crankshaft. Detachable front and rear crankcase covers with ball bearings admitted the crankshaft. Crankshaft machined in 2 parts from BND steel alloyed with chrome and nickel was joined together at center by a tapered section secured by a bolt within a 3rd ball bearing. This bearing outer race was carried by a bronze diaphragm which was inserted with the crank from the rear of a heated crankcase. When cold the diaphragm was an interference fit but still bolted by 5 radially disposed bolts. White metal big end bearings were used with a 13mm gudgeon pin secured in rod small end by a bolt. 2 compression rings were used. White metal big end bearings were used lubricated by oil thrown from the mains and caught by slinger rings. 2 bolt big-end con-rod was used. Slots in bottom of the circular crankcase delivered oil to a shallow sump with a unique lubrication system, a short shaft driven from crank nose powered a reciprocating pump with a steel ringed piston ring in a bronze housing which returned oil from sump to a pressurized oil tank under the driver’s seat, oil was then returned under regulated pressure to lubricate the bearings. This was a 1913 style dry sump system with minimal crank/con-rods rotating clearance inside crankcase. Camshafts were already made hollow back then. 2 valve springs per valve were used exposed to the cooling breeze. The valves were inclined at an included angle of 60 degrees. (A note:- sustaining a peak power speed of 2900RPM was at the time something grand indeed). Some extra links around the 1913 Peugeot. Mercedes 18/100 4.5 litre four. The crankshaft ran in 5 main bearings white metal-lined caps integral with the bottom half of the aluminum crankcase and pulled tight by long studs through the upper half of the crankcase to the top surface where the individual cylinders were attached. The crankshaft was not reliable at 3500RPM until it was made from special Aquila steel supplied by Austrian firm of Danner carrying white metal bearings cast into removable bronze shell. The big-ends of con-rods were held together by 4 bolts each. The pistons were cast iron. 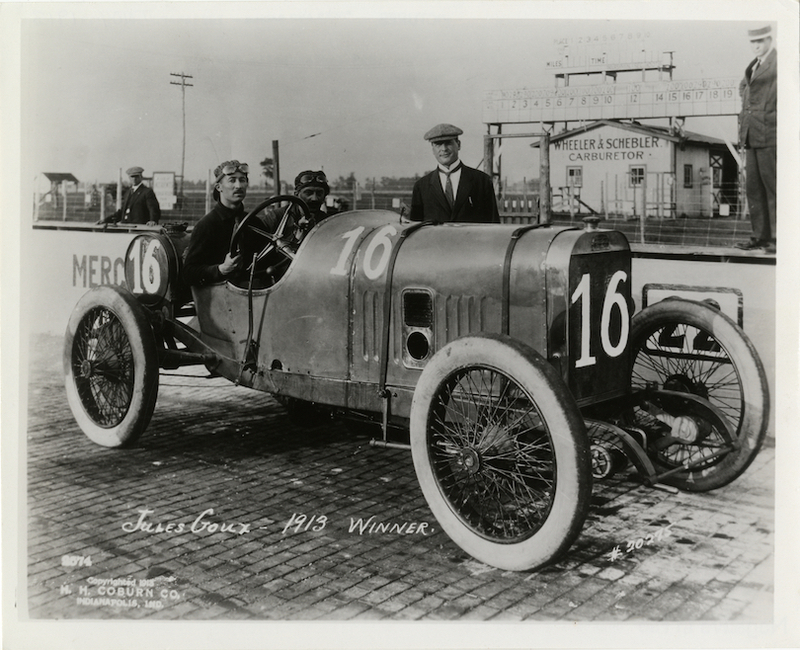 Aluminum pistons were refused entry to race as on the grounds that a metal with such low melting point would not possibly stand up to engine combustion temperature. But Mercedes went ahead and produced aluminum pistons (works type M93654) and tested them with complete success. The final decision as to whether to use them was left to the drivers but drivers elected to race with cast iron pistons. 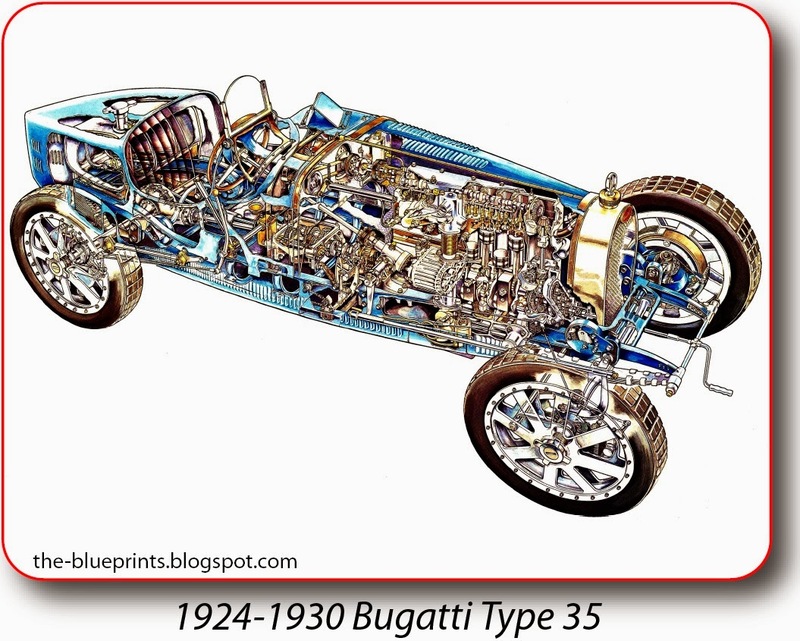 At that time drivers doubled as mechanics and some even demanded the use of bronze piston rings bellow the gudgeon pin, others the use of 2 rings bellow the gudgeon pin. Iron rings were used above the pin which floated in a bushing lubricated by an oil pipe running the length of the rod shank. Lubrication was by a battery of piston type oil pumps driven by a transverse shaft at the back of the sump, these served the bottom end of the engine. One of the oil pumps delivered oil to mains and rod bearings at more than 30psi, another scavenged oil from the front part of the sump to the main basin at the rear, a 3rd pump metered fresh oil into the engine from an 11-litre capacity reserve tank in the cockpit. Vertical shaft drive to the overhead camshaft at the rear was used. Individual steel cylinders each was taper threaded into a thin wall cylinder head casting, the water jacketing was welded around this assemble. 4 valves per cylinder each valve closed by a single spring retained by a threaded keeper, a forked rocker arm operated both valves from one lobe. Hollow camshaft running in 5 bearings. An independent total-loss oil system for the top end, the riding mechanic manipulated a plunger pump by foot to deliver oil to the rocker chambers. 2 spark plugs on the inlet side of each chamber and one on the exhaust side and a boss was provided for a 4th if needed all sparked by 2 magnetos. Peak torque 296Nm @ 2000RPM. Excellent super clear pictures/photos Hollus, notice the exposed-to-the-breeze valve springs trend of that time. The 1913 Peugeot L3 engine drawing is not the original drawing and not a correct drawing (I do have that drawing and know by whom that drawing was) that drawing shows a ‘swinging on a pivot finger cam follower’ the L3 finger follower was an ‘L’ shaped follower that moved/slid up and down on a pillar and had its own dedicated return coil spring to keep the finger in contact with the cam-lobe. Thanks SS, these are much appreciated. You might want to consider hosting the images on F1technical because this thread might be viewable 10 years from now but more than likely any hyperlinked images wont be. 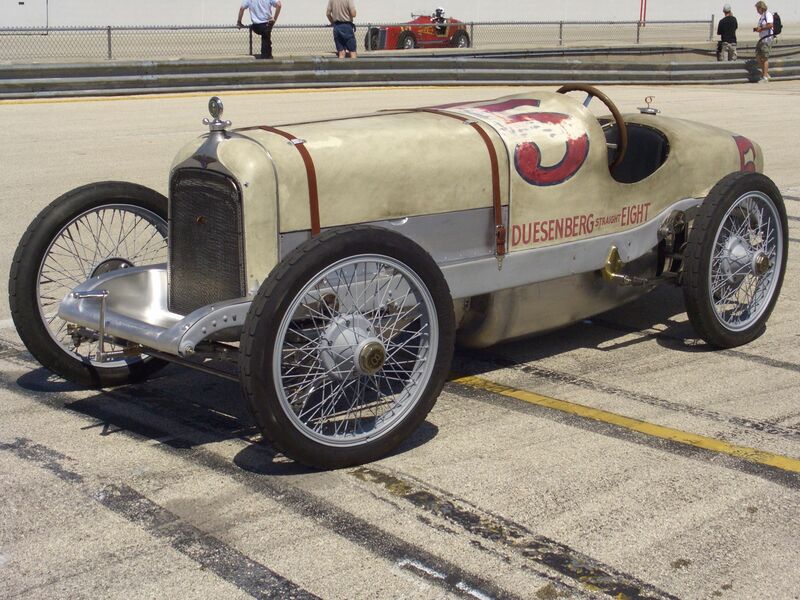 1921 Duesenberg 3-litre eight: Block and detachable cylinder head were cast of grey cast iron. The crankshaft of this straight eight ran in only 3 main bearings. The crankshaft machined from solid was configured like 2 four cylinder crankshafts end to end with one rotated 90 degrees with respect to the other. The block was of the deep skirt type extending way below the crankshaft center line covering the whole crankshaft. The front main bearing one piece bulkhead was cast with the block. The front main bearing was plain one piece (bushing) the center main was also plain but in 2 piece housing drawn up to the block by bolts the rear main was a number 220 ball bearing with a 7 inch outer diameter nested into the rear bulkhead of the block and retained by a cover, this bearing also managed the thrust loadings. Flywheel machined from steel was bolted to crankshaft with a clutch fully inside it. Split con-rod caps retained plain big end bearings with 2 bolts. All crankshaft plain bearings had a coating of 0.75mm thick bearing babbit metal. Gudgeon pin was secured in split con-rod small end by bolt. Oil under pressure was supplied to the 2 plain main bearings. The crankshaft webs were circular with a deep grove machined into the O/D with shrunken ring in it and soldered this grove formed the oil passage to the bid-end bearings. Twin gear-type pumps provided for dry sump oiling system. 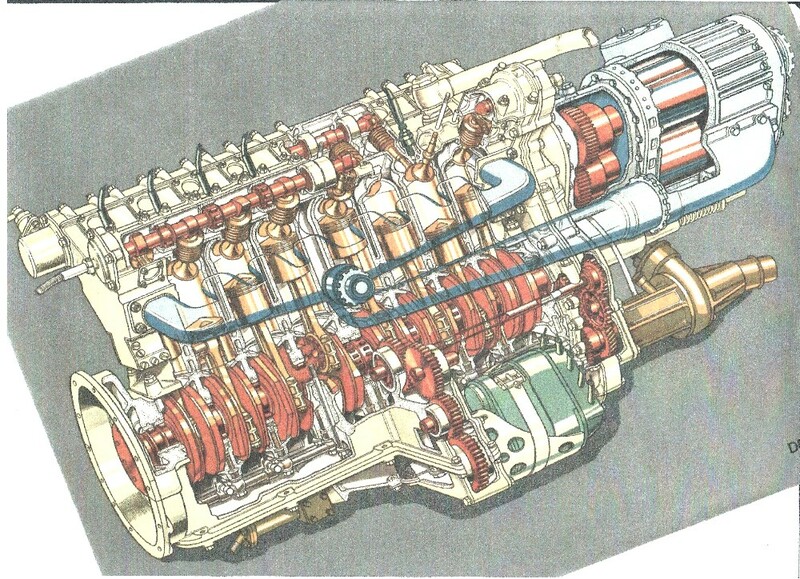 Pressurized oil was supplied to the front bearing of the single overhead camshaft, from which it travelled through the hollow shaft to the cam’s other bearings. A passage delivered oil on which the valve rocker arms pivoted. A trough below the camshaft collected oil which bathed the cam lobes before draining through the housing that carried the cam driveshaft. From the crank nose a bevel gear and another bevel gear on a shaft that ran upwards having another bevel gear at top ran a half speed bevel gear on camshaft. One inlet and one exhaust valve per cylinder were used. The valves were symmetrically inclined at an included angle of 60 degrees, twin coil springs closed each valve. Aluminum pistons was used. An access aperture in crankcase allowed piston and co-rod assemble to be removed past the crankshaft from the bottom. Early engines used 2 rings with later once using 3 rings. Rocker arms were roller-tipped on cam lobe. Peak power 115 BHP@4250 RPM. Piston speed corrected 12 m/s. 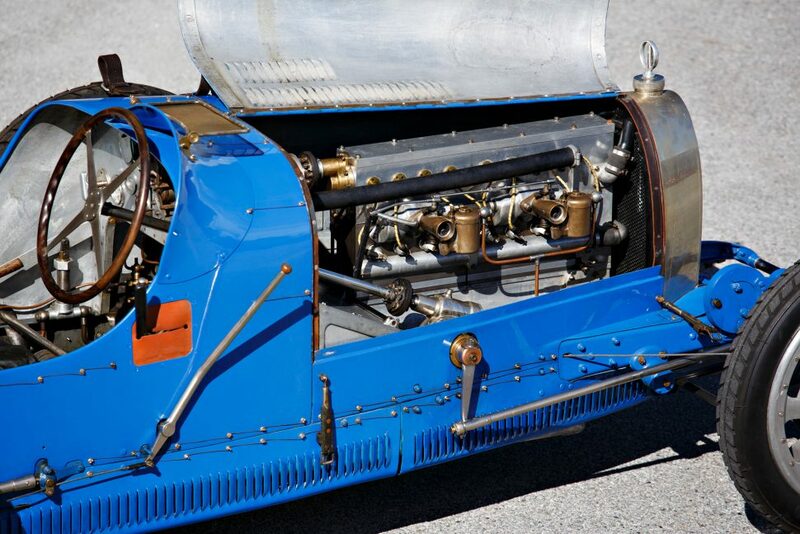 The 1925 type 2-litre eight engine actually dated from 1922 when it was fitted to 4 or 5 racing cars built to compete under 2-litre GP limit. 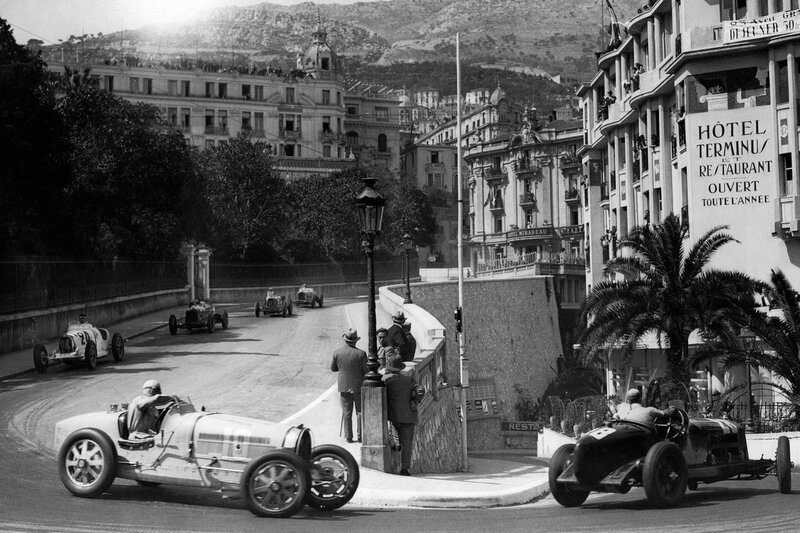 The 2-liter GP limit continued through 1925. Shaft driven through bevel gears from crankshaft, one overhead camshaft operated 3 valves per cylinder: 2 intake and 1 exhaust. All valves were positioned dead vertically. At 35mm the exhaust valve needed a recess to be machined in the side of the combustion chamber to accommodate its opening. Cylinder head and block were integral (monobloc construction). Pivoting fingers between cams and valves stems acting on hardened caps atop the valves were used. Each valve had its own cam lobe. The fingers multiplied the cam lobe lift by a ratio of 1.5:1. Each valve was closed by 2 springs. Camshaft rotated in bronze bushings. Cam was in 2 pieces and joined at center. Cylinders were incased in 2 four cylinder head-block units mounted on a common crankcase and topped by a common cam-box. Horizontal positioned spark-plugs were used. The crankcase was split at the crank centerline. Wet sump was used through the sump ran an array of aluminum tubes providing cooling air to the castor oil used. The sump provided the supporting caps for front and rear of the 5 main bearings. Individual caps were used for the center 3 mains. All the main bearings were anti-friction, front rear and center were double-row ball bearings with their own inner and outer races, while the other 2-those at the center of each set of 4 cylinders- were crowded 11mm rollers running directly on crank journal and with a very deep split outer race. Big-end had 17 rollers in bronze gages also running on journals, all this required the crank to be build-up of 2 identical 4 cylinder cranks which were joined in center bearing by a taper. The sections of each 4 cylinder crank were firmly and accurately wedged together by pins with tapered flats drawn-up by nuts. Inlet opens 10 degrees BTDC. Inlet closes 35 degrees ABDC. 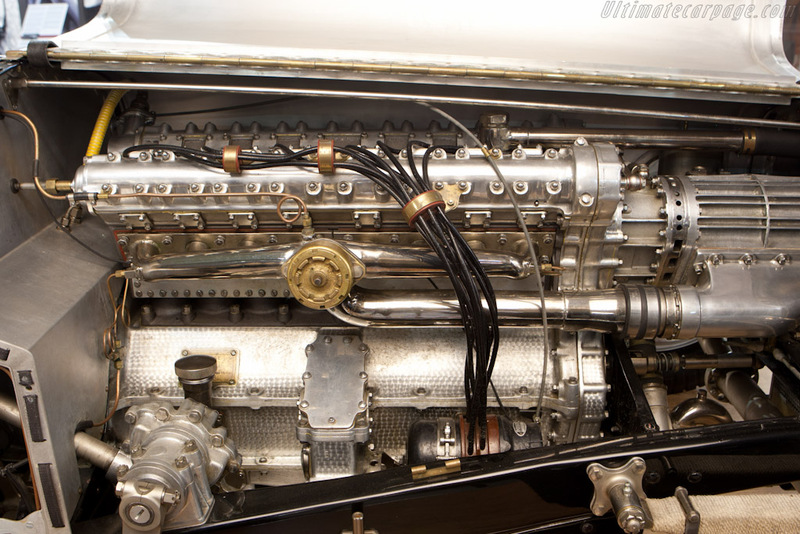 The 1927 Delage 15-S-8 was supercharged by a large single Roots-type blower extending forward from the front of the camshaft gear train which was at the front of the engine. Running at engine speed the blower had a capacity of 1.4 litres with its 2-lobed rotors 220mm long. A horizontal Cozette carburetor was used. Maximum boost pressure of 7psi was used. 1 inlet and 1 exhaust valve per cylinder each inclined 50 degrees from the vertical were used. A central 18mm sparkplug was used. A single iron casting comprised complete head and block. Block extended down to bottom of cylinders. Twin overhead hollow nickel-chrome steel camshafts each running in eight roller bearings and acting on finger followers. 2 pressure oil pumps, 1 lubricated camshafts and supercharger and accessories. The other the crankshaft, a 3rd pump scavenged the sump. Pipes in sump supplied oil to main bearing caps. 8 double-row roller and 1 double-row ball main bearings with split gauges were used running directly on the hardened journals. One piece nickel-chrome steel crankshaft was used. Oil slingers lubricated the big-end bearings. Nickel-chrome steel con-rods with removable caps were used. A 22mm gudgeon pin and a die-cast 3 ring aluminum pistons were used. Gear driven from accessory drive water pump was used. 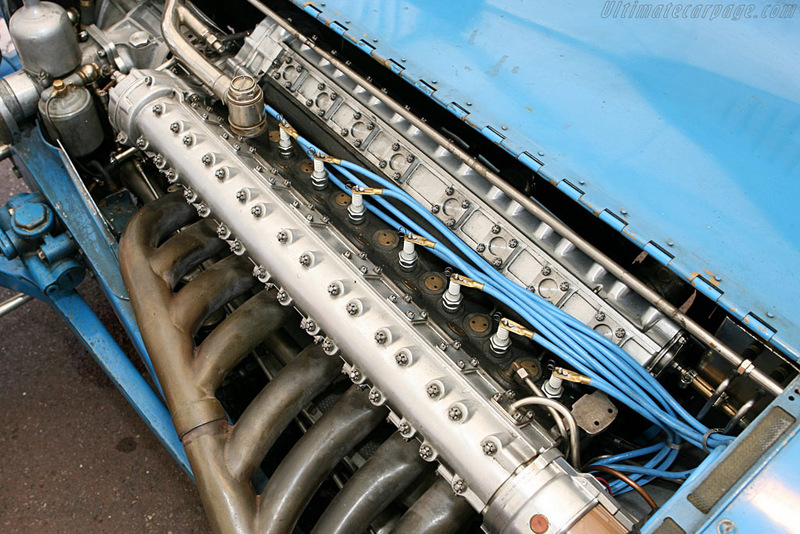 The 1927 Delage 15-S-8 1.5 litre eight engine contained no less than 62 ball and roller bearings, from an idler in the front train of gears was driven a shaft running toward the rear of the engine along its right-hand side, it stopped halfway along the engine and powered a gear train that led down to the magneto carried in a cradle alongside the crankcase, for a high-speed engine this was a crucial component, it was made by Bosch. A fabricated exhaust manifold on the left side led to a single exhaust pipe. 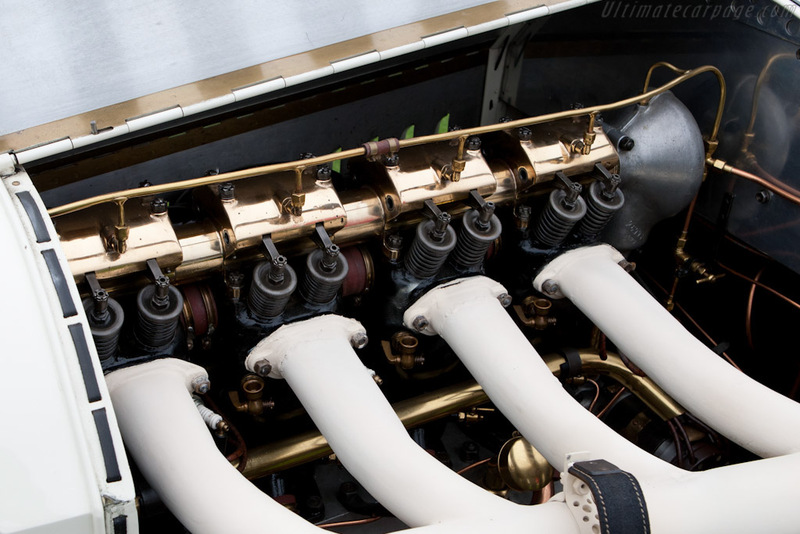 This engine at its time was regarded as Europe’s finest 1.5litre racing engine. Inlet opens 18 degrees BTDC. Exhaust opens 58 degrees BBDC. Exhaust closes 25 degrees ATDC. Peak power 170 BHP @ 7500 RPM. Piston speed corrected 16 m/s. BHP/litre 114.3 BHP per litre.